Forget About Global Warming - We're One Step From Extinction! Later in the evening, we had a conversation here at SOTT Central about this article and how it relates to a book that is currently being passed around in the house here: The Cycle of Cosmic Catastrophes: Flood, Fire, and Famine in the History of Civilization by Richard Firestone, Allen West, Simon Warwick-Smith. This book is about the "Event" that took place about 12,000 years ago that is recorded in myth and legend variously as the Fall of Atlantis and Noah's Flood. Plato describes a destruction that occurred in a day and a night, and the Bible recounts the story of torrential rains and an immense flood in which most of the life on earth perished. There is also a rich body of Native American literature about a worldwide cataclysm of fires, followed by floods and death raining down from the skies. As many as fifty different cultures around the globe record versions of this story, and physicist Firestone, along with his geologist co-authors, have put together a book, based on hard scientific evidence, describing a cosmic chain of events that they believe culminated in the global catastrophe of 12,000 years ago. They believe that the Event was triggered by a nearby supernova that occurred 41,000 years ago. Regular readers of SOTT are familiar with Cassiopaea website and the experiment in superluminal communication that I began in 1992 which finally bore fruit in 1994 on the day that the fragments of Comet Shoemaker Levy began impacting the planet Jupiter. We find it amusingly synchronous that one of the themes of the Cassiopaean information is planetary destruction via a Comet Cluster that cycles through the solar system every 3,600 years as a consequence of the orbit of our Sun's solar Companion, a smaller, dark, Twin Sun. As it happens, Firestone, West and Warwick-Smith also talk about a bombardment of Planet Earth by literally thousands of asteroids, comets, or other debris, though they attribute it to the supernova 28 or 29 thousand years earlier; it took that long for the ejecta from the supernova - along with debris it kicked out of the Oort cloud - to reach Earth. With the idea that there is a Cometary Bombardment Cycle, we have naturally been alert to the fact that the last few years have brought increasing evidence that this theory may very well be the correct one. Anyway, to get back to our conversation about humanity being past its "extinct by" date, I mused that anybody with eyes and ears and a bit of scientific knowledge can look around and see that something is going on "out there". It's in the news everyday, you just have to search for it (or read SOTT: we do the searching for you). The evidence that is all around us nowadays even helps us to realize that there was nothing really magical or mysterious about the story of Noah. The Bible tells us that God told Noah that something was up, something was coming, and that he should build an ark and that would enable him and his family and a few critters to survive. But obviously, in this day and time, we really don't need God to tell us that Something Wicked This Way Comes. Noah probably didn't either. 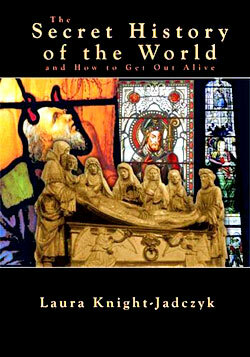 "Is there going to be an end of the world as described in the Bible, and if so, what does it really mean?" It was that question that lead to a deep study of the Bible, which then led to a realization that the destruction described in the book of Revelation was almost identical to what was described in the story of the Exodus, so whatever happened then, was being predicted to happen again. It wasn't until I read Velikovsky's Worlds in Collision that I realized that this was very likely talking about a bombardment of the Earth by rocks and bolides from space. Velikovsky, of course, attributed it to an errant planet Venus that came careening into the solar system just as Firestone et al attribute it to a supernova 41,000 years ago. The Cyclic Comet Cluster related to a Companion Sun explanation is a better fit to all the data, though a supernova could also be involved as well as a "Newcomer" to the Solar System. Reading Velikovsky changed the flavor of my research from metaphysical to scientific, and the result was "The Noah Syndrome." In any event, what is perfectly clear is that the story of Noah and the story of Atlantis are apocryphal: many small groups of people around the world survived the event of 12,000 years ago here and there, and very likely many of them survived because they realized what was coming - they "read the signs". Afterward, in their stories and legends their descendants ascribed their survival to the intervention of their particular deity to give that deity more authority. Bottom line is: anybody can be a Noah today if they are informed and pay close attention to what is going on. We are told that some say the world will end in fire, some say in ice, wrote Robert Frost. But whatever is to be our fate, it is now overdue. After analyzing the eradication of millions of ancient species, scientists have found that a mass extinction is due any moment now. Even worse, scientists have no idea about its source. This part of the article is actually quite disingenuous. It is well known that there are other major extinctions and the cycle is not ONLY every 62 million years! There is also a very strong signal for a 26 million year extinction cycle. The different estimates of the number of major mass extinctions in the last 540 million years are due mainly to what the individual researcher chooses as the threshold for naming an extinction event as "major" as well as what set of data he selects as the determinant measure of past diversity. As it happens, the 62 million event data stems mainly from marine fossil evidence. Well, they have a problem, don't they? They think it's coming and, based on the ancient legends, it happens very fast and almost without warning. The classical "Big Five" mass extinctions identified by Raup and Sepkoski in 1982 (interestingly, right about the same time I started asking questions about the End of the World as prophesied in Revelations culminating in The Noah Syndrome in 1985!) are widely agreed upon as some of the most significant. Raup and Sepkoski are mentioned as identifying the "Big Five", but the fact is that Sepkoski, a University of Chicago paleontologist actually suggested that the extinction of the dinosaurs 65 million years ago was part of a 26 million year cycle!! However, I would like to mention that if you multiply 26 there are interesting results such as: 3 X 26 is 78 - which just happens to be the time between the Ordovician and Devonian extinctions; 4 X 26 is 104 which is very close to the 106 million years between the Devonian and Permian extinctions; and 5 X 26 is 130, which (when dealing with these kinds of numbers) is close enough to the gap between the Triassic and K-T extinction to be in the ballpark. So, maybe there is something to this 26 million year thing after all, only each "return" has varying effects based on many other solar system variables. A companion star with a 26 million year orbit might be more stable, since Muller has suggested that a 62 million year orbit is too great to be stable. As it happens, if we postulate the 26 million year orbit of a Companion Star, using the Big Five Extinctions as our jumping off point, we would find that there ought to have been a return about 39 million years ago, and then another 13 million years ago, which would put us half-way in the Companion star orbit cycle now. Question: is that half-way as in aphelion or perihelion? Wherever the theorized Twin Sun might be at the moment, what we know is that there are other extinction events of great magnitude that seem to have little to do with just a 62 million year cycle and a great deal to do with some other cycle. Another thing that is a fact is that extinction events occur far more frequently than the general public is aware of and yes, we are way overdue for one. Of all the ways scientists have proposed to cause a mass extinction here are a few of the front runners. It is important to realize that numbers 3 and 4 are essentially ways which have been put forward to explain 1 and 2, though Snowball earth and Greenhouse earth are still theories in their own right, as they are to some extent self replicating, i.e. we rather get stuck in vicious circles as the more we warm the earth, the more greenhouse gasses we can potentially release, (at least in theory). The simplest answer to this is climate. Every species alive on earth today and so presumably in the past is adapted to a certain range of conditions. In the same way that if we were suddenly whisked off to the North Pole and expected to live there for a year with only a woolly jumper and a Mars bar, we would surely die. It is the same in an extinction event, climatic zones essentially shift around the globe (so us being placed on the north pole is not as far fetched as you first thought), or ecosystems are starved of light or nutrients. This results in plants and animals being out of equilibrium with their surroundings, this not only causes the death of individuals but whole species. If we consider the example of us at the North Pole, but this time with a whole box of Mars bars, assuming we did not freeze to death in the first day, we would slowly become more accustomed to the cold, maybe we would find shelter from the cold, but either way as soon as our prey (the Mars Bars) ran out, unless we found an alternative source of food we would starve. To create a more dynamic ecosystem let us assume we provide a food source for another organism such as a polar bear, now if we died what would the polar bear eat? Unfortunately my example falls down here as no one is going to believe that without us eating Mars bars they're going to reproduce uncontrollably. However, in our North Pole ecosystem of Mars bars, us and Polar bears, let us assume we find extra clothes and shelter, so the cold no longer controls our numbers, and we manage to find the recipe and ingredients for mars bars (and by some freak coincidence they provide us with all the essential nutrients for life), in this case it would be the polar bears controlling our numbers since they are our direct predators. So if polar bears were wiped out, then our numbers would no longer be controlled, so our population would over many generations grow, until eventually we could no longer supply ourselves with mars bars, or we may have even eaten all the mars bars in the world. This would cause a huge population crash, or maybe even extinction of the human race (or at least those dependent on Mars Bars). This rather abstract example helps illustrate the point that all the trophic levels of a food chain (or web) need to be in place, otherwise there will be instability in all other populations. The above description of how Global warming or cooling can cause mass extinctions is clever, but it does not take into account the creativity of human beings. Certainly, there could be massive reductions in the human population as a consequence of Global Warming or Cooling, but it would be unlikely to produce a mass extinction such as those for which we have evidence in the past. Back in the 1940s Dr. Frank C. Hibben, Prof. of Archeology at the University of New Mexico led an expedition to Alaska to look for human remains. He didn't find human remains; he found miles and miles of icy muck just packed with mammoths, mastodons, and several kinds of bison, horses, wolves, bears and lions. Just north of Fairbanks, Alaska, the members of the expedition watched in horror as bulldozers pushed the half-melted muck into sluice boxes for the extraction of gold. Animal tusks and bones rolled up in front of the blades "like shavings before a giant plane". "pulled apart by some unexplainable prehistoric catastrophic disturbance." The evident violence of the deaths of these masses of animals, combined with the stench of rotting flesh, was almost unendurable both in seeing it, and in considering what might have caused it. The killing fields stretched for literally hundreds of miles in every direction. There were trees and animals, layers of peat and moss, twisted and tangled and mangled together as though some Cosmic mix master sucked them all in 12000 years ago, and then froze them instantly into a solid mass. Just north of Siberia entire islands are formed of the bones of Pleistocene animals swept northward from the continent into the freezing Arctic Ocean. One estimate suggests that some ten million animals may be buried along the rivers of northern Siberia. Thousands upon thousands of tusks created a massive ivory trade for the master carvers of China, all from the frozen mammoths and mastodons of Siberia. The famous Beresovka mammoth first drew attention to the preserving properties of being quick-frozen when buttercups were found in its mouth. What kind of terrible event overtook these millions of creatures in a single day? Well, the evidence suggests an enormous tsunami raging across the land, tumbling animals and vegetation together, to be finally quick-frozen for the next 12000 years. But the extinction was not limited to the Arctic, even if the freezing at colder locations preserved the evidence of Nature's rage up to our present time. "no one knows the answer." He is also honest enough to admit that there is the larger problem of the extinction of many other species in America at the same time. The horse, giant tortoises living in the Caribbean, the giant sloth, the saber-toothed tiger, the glyptodont and toxodon. These were all tropical animals. "gradual onset" of an ice age, "unless one is willing to postulate freezing temperatures across the equator, such an explanation clearly begs the question." This event was global. The mammoths of Siberia became extinct at the same time as the giant rhinoceros of Europe; the mastodons of Alaska, the bison of Siberia, the Asian elephants and the American camels. It is obvious that the cause of these extinctions must be common to both hemispheres, and that it was not gradual. A "uniformitarian glaciation" would not have caused extinctions because the various animals would have simply migrated to better pasture. What is seen is a surprising event of uncontrolled violence. "insuperable difficulty" to the theory of uniformitarianism, since no gradual process can result in the preservation of tens of thousands of tusks and whole individuals, "even if they died in winter." This is true especially when many of these individuals have undigested grasses and leaves in their belly. "Sudden death is indicated by the robust condition of the animals and their full stomachs... the animals were robust and healthy when they died." Unfortunately, in spite of this admission, this poor guy seems to have been incapable of facing the reality of worldwide catastrophe represented by the millions of bones deposited all over this planet right at the end of the Pleistocene. "The Pleistocene period ended in death. This was no ordinary extinction of a vague geological period, which fizzled to an uncertain end. This death was catastrophic and all inclusive." and the end of the "reign of the gods," all came to a global, catastrophic end about 12,000 years ago. But if the above accounts are the result of such a catastrophe, what might the catastrophe itself be like? It begins with meteors failing like raindrops, a few here and there. Perhaps a few hit the sun, provoking large solar flares. The solar flares provoke colorful auroras even in the daytime sky. Then the day of the comets arrive. From horizon to horizon, growing larger every second, they streaked into the atmosphere, lighting up brighter than the sun. Heated to immense temperatures by its passage through the atmosphere, the lethal swarm exploded into thousands of mountain-sized chunks and clouds of streaming icy dust. The smaller pieces blew up high in the atmosphere, creating multiple detonations that turned the sky orange and red. Then the largest comet smashed through the sheet of ice covering part of the northern hemisphere in what is now Hudson Bay. Other comets struck in Lake Michigan, Canada, Siberia and Europe. Then the ground shock waves hit, shaking the earth violently for ten minutes in great rolling waves and shudders. Fissures opened, trees shook and fell, and rivers and streams disappeared into the cracked earth. 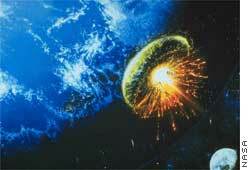 Within seconds of the impact, the blast of superheated air expanded outward at more than 1,000 miles an hour, racing across the landscape, tearing trees from the ground and tossing them into the air, ripping rocks from mountainsides, and flash-scorching plants, animals, the earth, as well as any humans in its way. The only living things to survive would have been those who had sought shelter underground or underwater. Across the upper part of North America and Europe, the immense energy from the multiple impacts blew a series of ever-widening, giant, overlapping bubbles that pushed aside the atmosphere to create a near vacuum inside. As the bubble passed by, the air pressure dropped making it difficult to breathe. Behind the expanding edge of the bubble, the Earth was stripped of the protective shield of the atmosphere. The blast had ejected tiny, fast-moving grains in all directions through the thin air. Some lodged into trees, plants and animals, while others went up only to fall back again at incredible speeds as there was no atmosphere to break their fall. At the same instant, high speed cosmic rays bombarded the area with radiation. Animals and humans dropped dead on the spot from the bombardment. Inanimate objects appeared to come to life and shiver and quake on the ground from the barrage. When the outward push of the shock wave ceased, the vacuum began to draw back the air. 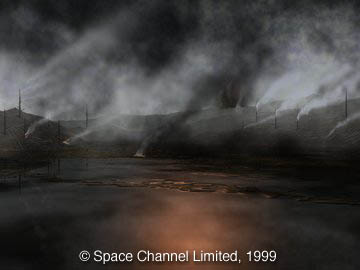 As the expanded atmosphere rushed back toward the impact site, the bubbles collapsed, sucking white-hot gases and dust inwards at tornado speeds and then channeling them up and away from the ground. Some of the dust escaped from the Earth's atmosphere while the rest flowed out as a red mushroom cloud that flattened out for thousands of miles across the upper atmosphere, blocking the sun and engulfing the Earth in darkness. The raging updraft through the hollow bubbles created an equally powerful downdraft of frigid, high-altitude air, traveling at hundreds of miles per hour. With temperatures exceeding 150 degrees F below zero, the downward stream of air hit the ground and radiated out from the many blast sites in all directions, flash-freezing within seconds everything it touched. The howling, frigid blast turned trees and plants into brittle ice statues and flash froze mastodons and mammoths with food in their mouths that we have uncovered still frozen in Siberia. The rapid temperature fluctuations meant the end of millions of plants and animals... but the destruction was only beginning. The impacts, the blast waves, and the eruptions started thousands of ground fires wherever there was fuel to feed them, some of which continued to burn for days. Fast-moving, wind-driven wildfires formed spiraling tongues of raging flames that twisted for thousands of feet into the air and the inferno raced through forests faster than birds and animals could flee. The roar of the fire shook the ground, and the fierce heat blew apart trees like bombs, exploded rocks like shrapnel grenades, and set off steam explosions wherever the fast-moving fire-front jumped across frozen ponds and streams. When the fires had finally burned themselves out, there was little left besides smoldering stumps and telltale charcoal strewn across the continents. The impact in Hudson Bay sent up 200,000 cubic miles of the glacier, throwing off the icy debris that followed the pieces of the comet out across the continent. 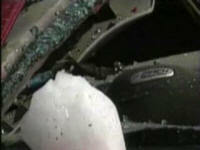 A rain of incandescent debris and chunks of steaming ice showered down across most of North America, Europe and Asia. Within minutes, the massive, low-flying clumps crashed into the Carolinas and the eastern seaboard, exploding into fireballs and gouging out the Carolina Bays, over 500,000 of them. Other lumps exploded across the plains from Nebraska and Kansas to Arizona. The impact through the glacier at Hudson Bay sent high velocity melt-water surging under the ice sheet. The surges lifted and floated large sections of ice, causing monolithic ice blocks to slide southward along hundreds of miles of the ice front. Moving nearly as quickly as a horse is able to run, the blocks plowed over forests, shearing off the trees. Its momentum spent, the churning water paused briefly and then began its rush backwards to the coast, pulling with it the battered remains of plants and animals under its tow. The surge provoked, in turn, offshore landslides in Europe and Africa, sending a second round of mega-waves back towards North and South America. Miles of coast land was hit by the 100 foot waves that triggered yet another wave of tsunamis that hit Europe and Africa once again. But little was left to damage. Within minutes of the impacts, the subzero air and rising water vapor combined to produce heavy snow and sleet that reached as far south as Mexico, the Caribbean, and Northern Africa. In the south, the snow turned to rain and the northern hemisphere was under a steady downpour for months, a downpour of noxious water contaminated and deadly. Anyone lucky enough to survive was now a potential victim of acid, toxic metals, cyanide, formaldehyde, and arsenic, a combination that would kill many and render the rest gravelly ill.
You will, of course, notice that "12,000 years ago" is just a rough estimate because some of the dates of their data come back as old as 14 KYA and as recent as 10 KYA. When considering a 3600 year Comet Cluster Cycle, this range could cover more than one event. But what is important is that the main event did, apparently, happen in a single day and based on the scientific data collected by Firestone et al, it was one of the most horrifying events ever to happen on planet earth since modern Homo-Sapiens appeared. Sixty is a large number to use as a base for a numbering system. It is taxing to the memory because it necessitates knowing sixty different signs (words) that stand for the numbers from 1 to 60. The Sumerians handled this by using 10 as an intermediary between the different sexagesimal orders of magnitude: 1, 60, 602, 603, etc. The word for 60, geš, is the same as the word for unity. The number 60 represented a certain level, above which, multiples of 60 up to 600 were expressed by using 60 as a new unit. When they reached 600, the next level was treated as still another unit, with multiples up to 3,000. The number 3,600, or sixty sixties, was given a new name: šár, and this, in turn, became yet another new unit. Why did the Sumerians enshrine the number 60 - and its multiple 60 X 60 - in their numbering system? Zecharia Sitchin believed that it was because there was a 10th planet in the solar system that had an orbit 3600 years long, and that they based their numbering system on the cycle of this event. But the evidence for the 10 planet - as a planet - and his related ideas, is rather skimpy, while the evidence for bombardment of the earth by masses of cometary debris is growing every day. Examining the hard data, it doesn't take a genius to figure out that if there is something that returns every 3600 years, it is more likely to be a cluster of cosmic bodies than a 10th planet. At a certain point in our history, the major civilizations of the world collapsed, simultaneously it seems. The Akkadian Empire in Mesopotamia, the Old Kingdom in Egypt, the Early Bronze Age civilization in Israel, Anatolia and Greece, as well as the Indus Valley civilization in India, the Hilmand civilization in Afghanistan and the Hongshan Culture in China - the first urban civilizations in the world - all fell into ruin at more or less the same time. Not long afterward, in archaeological time, disaster overtook the Myceneans of Greece, the Hittites of Anatolia, the Egyptian New Kingdom, Late Bronze Age Israel, and the Shang Dynasty of China. Agreement, however, there has never been. Some researchers favored one type of natural cause, others favored another, and the problem remained that no single explanation appeared to account for all the evidence. 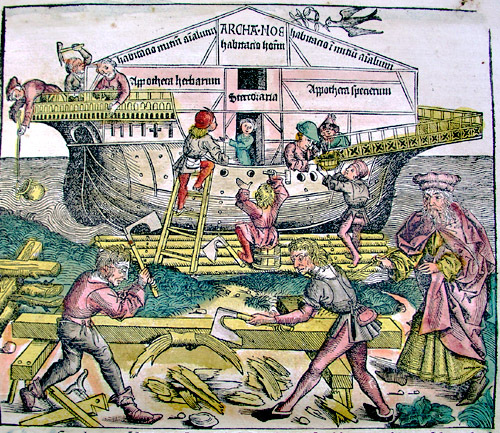 Over the past 15 years or so, however, a new type of 'natural disaster' has been much discussed and is beginning to be regarded, by many scholars, as the most probable single explanation for widespread and simultaneous cultural collapse, but not only in the Bronze Age but at another times as well. Yet what was the cause of these earthquakes, eruptions, tidal waves, fire-blasts and climate changes? 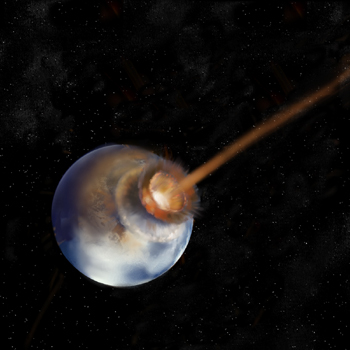 By the late 1970s, British astronomers Victor Clube and Bill Napier of Oxford University had begun to investigate cometary impact as the ultimate cause... Then in 1980, the Nobel prizewinning physicist Luis Alvarez and his colleagues published their famous paper in Science that argued that a cosmic impact had led to the extinction of the dinosaurs. He showed that large amounts of the element iridium present in geological layers dating from about 65 million BC had a cosmic origin. These scholars envisage trains of cometary debris which repeatedly encounter the Earth. We know that tiny particles of cosmic material penetrate the atmosphere every day, but their impact is insignificant. Occasionally, however, cosmic debris measuring between one and several hundred meters in diameter strike the Earth and these can have catastrophic effects on our ecological system, through multimegaton explosions of fireballs which destroy natural and cultural features on the surface of the Earth by means of tidal-wave floods (if the debris lands in the sea), fire blasts and seismic damage. Alternatively, comets and asteroids can explode in the air. A recent example - known as the Tunguska Event - occurred in 1908 over Siberia, when a bolide made of stone exploded about 5km above ground and completely devastated an area of some 2,000 km' through fireball blasts. 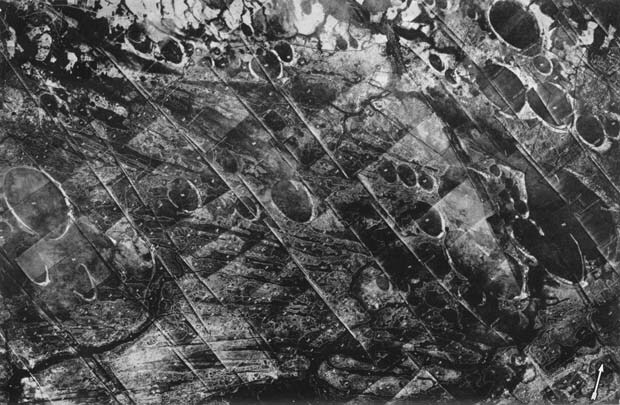 According to current knowledge, Tunguska-like impacts occur every 100 years or so. It is, therefore, not far fetched to hypothesize that a super-Tunguska may occur every 2000, 3000 or 5000 years and would be capable of triggering ecological crises on a continental or even global scale. In the past, skeptics have demanded the evidence of a crater before they would accept an argument of cosmic impact, but it is now become understood that no crater is necessary for disastrous consequences to ensue. The difficulty this leaves scholarship, however, is that in a Tunguska Event no direct evidence is left behind. It may be impossible to prove that one ever took place in the distant past. The extent to which past cometary impacts were responsible for civilization collapse, cultural change, even the development of religion, must remain a hypothesis. 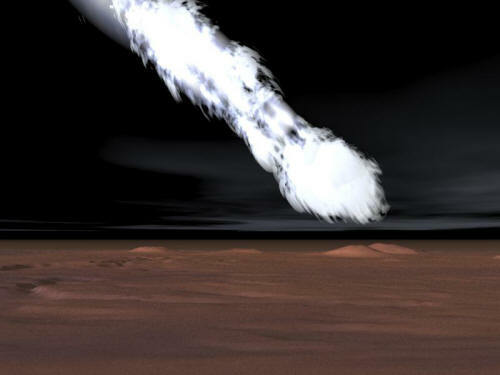 But in view of the astronomical, geological and archaeological evidence, this 'giant comet' hypothesis should no longer be dismissed by archaeologists out of hand. Among the many side-effects of cometary bombardments is earthquakes, tsunamis and volcanic eruptions. As it happens, there was a significant volcanic event at the time of the collapse of the Bronze Age civilizations that gives us a firmly fixed date: Thera. 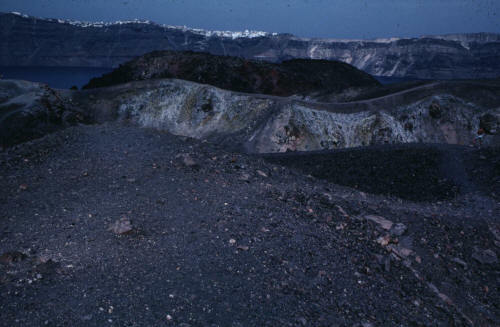 Recent developments published in the April 2006 issue of Science fix the date of the eruption between 1627 and 1600 B.C. with 95 % certainty. This, of course, is rejected by many archaeologists because they have spent their entire careers trying to date things according to the Bible, and it really upsets the apple cart to realize that they've been chasing an illusion. "large scale environmental changes possibly occurred in the Southern Hemisphere in the middle of the Holocene." [Microparticle Concentration And Electrical Conductivity of A 700 m Ice Core from Mizuho Station Antarctic, published in Annals of Glaciology (1-, 1988) pp. 38-42] (Within the last 10,000 years). Their depth profiles of microparticle concentration, electrical conductivity and Oxygen 18 at circa 1600 BC indicates a spike in readings for all of these elements. The evidence shows that this disturbance covered this designated period, but with a "huge spike" at c. 1600 BC. In an article in Nature, November 1980, C.U. Hammer, H. B. Clausen and Dansgaard date a disturbance from the Camp Century ice core to 5470 BC +/- 120 years. This compares to the proposed Hekla eruption which was radiocarbon dated to 5450 BC +/- 190 years. There is an appreciably high acidity signal at these sections of the core which indicates a high level of volcanic activity - again, right at the 3600 year cycle mark. Looking further: Michel R. Legrand and Robert J. Delmas of Laboratoire de Glaciologie et Geophysique de l'Environment published an article "Soluble Impurities in Four Antarctic Ice Cores Over the Last 30,000 Years" [Annals of Glaciology (10, 1988, pp 116-120)], in which they graphed the Oxygen 18 variations and the ionic components Na, NH4 and Ca2 and H and Cl and NO3 and SO4. The time scale for each ionic component level as well as the O18 levels stretches back 30,000 years. The graph shows correlations to spikes at 5,200 BC, 8,800 BC, 12,400 BC, c. 16,000 BC, c. 19,600 BC. All of these were times of great geologic stress. When looking at the data and taking into account the acknowledged dating inaccuracies (some of the ranges of dates can go 100 years in either direction of the spike, even though the spiking is regular and rhythmic) for the more recent dates, and 3 to 600 years variance for the older dates - especially when one considers that these are broad analyses and nobody was really looking for anything specific - they just said "wow! look at that wavy line!" - we find that the southern ice cores do not always register the same as the northern ones. The 1628 BC event that really slammed the tree rings in the northern hemisphere shows almost no registration in the Antarctic cores in terms of volcanic activity. But the northern cores show the activity beginning 1644 BC. The evidence for the 5200 BC event is strong in the Dome C core. The 8,800 BC event is well marked - in fact, seems to be the strongest of them all. Keep in mind that this was 10,800 years ago - exactly within the range of dates reported by Herodotus and Plato. The oxygen 18 isotope variation is noticeable, the rise in sea-salt, elevated levels of C1 and C1/Na. There is an extreme spike in SO4 and H readings suggesting widespread volcanic activity - great earth changes were happening at that time, and they registered in the climate, the oceans, and were preserved in ice. The 12,400 BC event is also extremely pronounced in the cores. The graphs show a quick, vast change including the end of the Wisconsin Ice Age. There is a great Oxygen 18 isotope variation as well as peaks of Na and very pronounced spikes in Ca, SO4 and H.
All over the Mediterranean there were kingdoms and cultures that communicated and traded with one another. Reading the many books on each region, produced by the various experts on the different cultures, again and again one encounters the fact that a period of severe disruption was noted in the historical and archaeological record. Somehow, such an event in one region is not necessarily connected to a similar event in another region. The idea that all of the disruptions in a given general time period may be simultaneous cannot be considered because it would disrupt the carefully constructed chronology that is based on endless acts of tetraphyloctomy. [Splitting a hair four ways; coined by Umberto Eco in Foucault's Pendulum]. In his book Stratigraphic Comparée et Chronologie de l'Asie Occidentale, [London, Oxford University Press, 1948] Claude Shaeffer's lifelong archaeological investigations led him to propose that a great natural catastrophe brought about the end of the Middle Kingdom in Egypt, and also devastated by fire and earthquake almost every other populated region of Crete, Cyprus, the Caucasus, Syria, Palestine, Persia, and Asia Minor in general. That's one heck of a "local event." It is only logical to conclude that the Santorini event and the end of the Middle Bronze Age are one and the same event. What is the relation between this companion star - Nemesis - and extinction? How can a star, way out beyond the solar system, have an effect on the third rock from the sun? 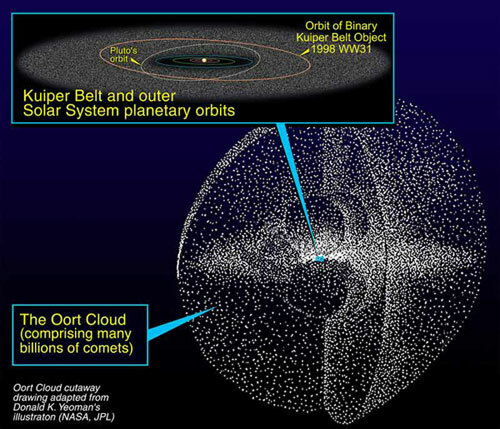 The Oort cloud, alternatively termed the Opik-Oort Cloud, is a postulated spherical cloud of comets situated about 50,000 to 100,000 AU from the Sun. This is approximately 2000 times the distance from the Sun to Pluto or roughly one light year, almost a quarter of the distance from the Sun to Proxima Centauri, the star nearest the Sun. The solar system is engulfed by this cloud comprised of billions of comets. Imagine what would happen if a star passed through that cloud, knocking the comets in the same way a bowling ball sends bowling pins scattering in all directions. Imagine then a certain number of those comets heading towards the centre of the cloud, our sun and its solar system. The sun, being the largest object in the neighborhood, would be the attraction point. The comets in the incoming cloud would be pulled into an orbit around the sun. So, we have a mechanism which can hypothetically trigger the launching of a swarm of comets into the solar system. The orbit of the proposed binary twin of our sun conforms to the cycles of major extinctions on Earth. But it is still a hypothesis. More importantly, you might ask, even if we assign a high probability to the truth of the hypothesis, if these cycles happen every 26 million years, what evidence do we have that we are alive during one of the, shall we say, unlucky periods? But the 17th century was interesting for another anomaly involving our sun: the Maunder Minimum. Between the years 1645 and 1715, our sun stayed in a period of solar minimum. During one 30-year period within the Maunder Minimum, for example, astronomers observed only about 50 sunspots, as opposed to a more typical 40,000 - 50,000 spots. The Maunder Minimum coincided with the middle - and coldest part - of the so-called Little Ice Age, during which Europe and North America, and perhaps much of the rest of the world, were subjected to bitterly cold winters. Recently published research suggests that the Sun's rotation slowed in the deep Maunder minimum (1666-1700). At our current level of understanding of solar physics, a larger and slower Sun necessarily implies a cooler Sun that provides less heat to Earth. Perhaps the close approach, astronomically speaking, of the dark companion was the cause of this dampening. The lower solar activity during the Maunder Minimum also affected the amount of cosmic radiation reaching the Earth. The resulting change in the production of carbon-14 during that period caused an inaccuracy in radiocarbon dating until this effect was discovered. The third edition of the university textbook Exploration of the Universe, by George O. Abell, published in 1975, informs us that Jupiter has 9 moons as of 1974. The outer seven, however, have rather eccentric orbits, some of which have a large inclination to Jupiter's equator. The four most distant satellites revolve from east to west, contrary to the motions of most of the other objects in the solar system. They may be former minor planets captured by Jupiter. However, counting the named satellites on the Timeline of discovery of solar system planets and their natural satellites gives us a count of 62, with 41 being discovered since 2000 and another ten in the 80's and 90's. Moving outward, we come to Uranus, given five satellites in 1975, it now has 28, with ten being discovered in the 1980's, six in the 90's, and 7 since 2000. The explanation given most often to explain this surge in the numbers of satellites for these planets is that telescopes have gotten better. That is, we can see further, with greater detail, and can therefore find things that we couldn't see before. It is an explanation that makes sense. One small problem with this theory is that the "new" moons of Neptune and Uranus showed up before the new moons of Jupiter and Saturn. One would think that powerful telescopes capable of finding moons as far away as the seventh and eighth planets would have found the hard to see moons of the fifth and sixth first. Another possible explanation, and one which fits with new moons appearing around Neptune and Uranus prior to appearing around Jupiter and Saturn, is that these new moons, or some of them, are objects that have been trapped into orbits around these planets only recently, that they were captured by the gravity of these planets and removed from the incoming comet cloud. Passing the orbits of the outer planets first, they would arrive at the inner planets afterward. NEWARK - Something happened at around 9 p.m. Wednesday that a lot of people heard, or even felt. What it was, though, might forever remain a mystery. Was it simply falling ice? That's what many, including NBC4's Jym Ganahl, believe. But many also went outside to check because it sounded like their houses had been hit. A few things have been eliminated. Instruments show it wasn't an earthquake. Wright-Patterson Air Force Base told NBC4 that it didn't have any flights in the area, and North American Aerospace Defense Command said it knew of nothing man-made entering the atmosphere. NORAD did report a flight of National Guard jets out of Toledo over southern Ohio, but it was not fast enough to break the sound barrier and create a sonic boom. Mike Hansen, director of the Ohio Seismic Network, said there's no evidence to suggest an earthquake could have caused the bang, especially not over the range specified. NBC4 has fielded calls from Fairfield, Muskingum and Pickaway counties, and the National Weather Service heard similar tales from Cincinnati, Wilmington and Lebanon. "I saw it first. It was the most eerie, cool, scary, wonderful thing. You just see this dragon tail going across the sky," said Gill, who also writes a religion column for The Advocate. "All of a sudden, everything goes boom." He said he checked his watch and thought it said 9:42 p.m., but now he can't be certain. A seismograph at the Ohio Seismic Network's office in Alum Creek picked up something that Hansen said was more than likely something noise-related, but other seismographs, including a more sensitive machine in the same building, didn't catch anything. That report was at 8:42 p.m., which is more consistent with the other reports. "His description there of the colors of it are consistent with a meteorite," said Hansen, who also has studied meteorites. "That would be an explanation of a sonic boom-type phenomenon." A sonic boom travels across terrain behind the aircraft - or meteorite - creating it, he said. The speed of an average meteorite, 25,000 miles per hour, would certainly allow for similar reports across the state, and if the object was at a low trajectory, it could be heard literally far and wide. The Licking County Sheriff's Office reported about 10 calls between 8:35 p.m. and 3:48 a.m. from residents hearing loud noises. Five of the calls came between 8:51 and 9:43 p.m.
Hansen said he hears similar time discrepancies all the time when dealing with earthquakes, which often are noticed as loud bangs. "People are notoriously bad at reporting the times," he said. "You have to look at these peoples' reports with a bit of skepticism on timing." Most reported the bang at or near 9 p.m., roughly around the same time the Ohio State basketball game was ending on TV. But some reports came in of multiple bangs, or some as late as 4 a.m. Thursday. Aside from the time discrepancies, the profile fits a meteor, said Christine Pulliam, public relations specialist for the Smithsonian Astrophysical Observatory. "Typically you have one coming in at a particular time," Pulliam said. No agency tracks meteors entering the Earth's atmosphere, however. "If it definitely wasn't anything manmade, then I guess a meteor's the most likely explanation." The National Weather Service's station in Wilmington is equally lost, especially after hearing calls from the Cincinnati area. The only common factor is that each area was affected by Tuesday's ice storm. "It definitely wasn't thunder," a meteorologist there said. "We're kind of stumped on that ourselves." Readers of NewarkAdvocate.com reported similar stories - a bang loud enough to shake houses, but with nothing apparently wrong afterward. "We live in Indian Hills (west of Granville off Ohio 16) and the explosion at approximately 9 p.m. was so loud it shook our house!" one reader wrote. "We thought a sheet of ice came off of our roof onto the deck or our roof had collapsed, but after further investigation we could find nothing amiss." Not everyone agreed that it was a meteor, however. Ganahl said every contact he's heard about the bang was writing from an area that got some layer of ice earlier this week. "I'm 100 percent certain that it's ice," he said. "It's only the areas that had a lot of ice. None have been from areas with just snow." "It almost looked like a plane crash," she said. 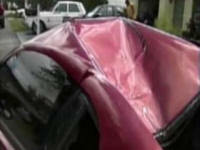 Her friend is an EMT and she listened to her scanner, but no reports came in. Meteor lights up the sky. It was not a UFO but a meteorite which crash through the earth's atmosphere and landed in Yesilkent. A startled Abdullah Ariturk revealed that the rock had smashed a hole in the ground at the Green Park Complex, at Yesilkent, narrowly missing him by ten metres. "I thought this was it. I thought it was the apocalypse. I saw the bang and the flashing lights and this rock smashed into the ground quite near me. It was very frightening." After telling the Voices of his story, Mr Ariturk is now awaiting scientists from Aegean University, in Izmir, to take the meteorite away for closer examination. 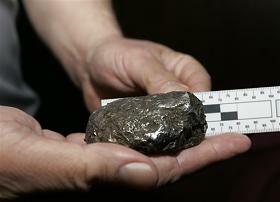 FREEHOLD TOWNSHIP, N.J. (AP) - Authorities were trying to identify a mysterious metallic object that crashed through the roof of a house in eastern New Jersey. TAMPA, FL (AP) - Raymond Rodriguez was changing a tire when an 18-inch chunk of ice plummeted from the sky with a piercing whistle, then a metallic crunch. 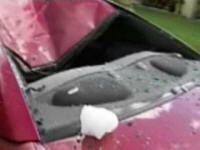 The ice chunk crushed the roof of a nearby Ford Mustang on Sunday morning. No one was hurt. The Federal Aviation Administration is reviewing flight schedules to see if the ice fell off a plane. The ice did not have a blue tint that would indicate it came from a plane's lavatory. The National Weather Service said conditions in Tampa were not favorable for the formation of large balls of ice, known as megacryometeors. Let's put together an overview of the data we have been collecting and outline the working hypothesis that we have to explain it. It isn't very hopeful, we'll tell you that right at the start. It may well make Tunguska look like a firecracker in comparison. There is an hypothesis that argues that our sun is part of such a binary system. The sun's hypothetical companion has been named, as mentioned above, "Nemesis". The projected orbit of Nemesis is 26 million years, give or take the time necessary for the rising and falling of several civilizations. We can offer no proof for the working hypothesis outlined above. We are working on a limited data set. The sun's dark companion, on its 26 million year orbit, came close to the solar system 377 years ago, showing itself and pushing in front of it comets, a few of which appeared thirty years after the 1630 showing of the dark star itself. 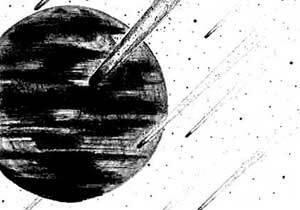 The passage of the companion through the Oort cloud dragging hundreds of thousands of other bodies in its wake, swung around in its orbit, and flung a swarm of them our way, traveling now for nearly four hundred years. Members of that swarm have been picked off by the gravitational fields of the outer planets, increasing the numbers of moons in recent years. If the swarm has passed by Jupiter, then it may be arriving here very soon. One final point. There have been reports that Earth is not the only planet being hit by "global warming". Might it be possible that this apparently widespread change of "climate" in the solar system is linked to an incoming comet cloud? We do not know and are sorely lacking in the means to acquire data to refine or reject the working hypothesis. Perhaps someone else out there does have the means. Whatever the explanation for a generalized warming of several planets, it is clear that we know very little about the fundamental mechanisms behind it. We are a speck in the universe, a drop in an ocean more vast, more complex, and more mysterious than we can imagine. If you want more evidence for what happened to the mammoths, you need only to look up at the clear night sky. In almost any month, you can see shooting stars from one of many meteor showers. Nearly every fiery streak you see is the tiny remnant of some giant comet that broke up into smaller pieces. Of course, most of those pieces are microscopic, but their parent comet was not - it was enormous. Astronomers know that, even today, hidden in those cosmic clouds of tiny remnants, there are some huge chunks of comet pieces. We pass through their clouds every year like clockwork, so eventually we will collide with some of bigger pieces. According to those scientists, every one is the offspring of the same massive comet that first entered our system less than 20,000 years ago! Clube and Napier calculated that, to account for all the debris they found strewn throughout our solar system, the original comet had to have been enormous. So was this our megafauna killer? All the known facts fit. The comet may have ridden in on the supernova wave, [or was knocked into the solar system by the Companion Star - LKJ] then gone into orbit around the sun less than 20,000 years ago; or, if it was already here, the supernova debris wave may have knocked it into an Earth-crossing orbit. Either way, any time we look up into the night sky at a beautiful, dazzling display of shooting stars, there is an ominous side to that beauty. We are very likely seeing the leftover debris from a monster comet that finished off 40 million animals 12 to 13,000 years ago. When we look at climate and ice-core records, we can see that pattern. For example the iridium, helium-3, nitrate, ammonium, and other key measurements seem to rise and fall in tandem, producing noticeable peaks around 18,000, 16,000, 13,000, 9,000, 5,000, and 2,000 years ago. In that pattern of peaks every 2,000 to 4,000 years, we may be seeing the "calling cards" of the returning mega-comet. Fortunately, the oldest peaks were the heaviest bombardments, and things have been getting quieter since then, as the remains of the comet break up into even smaller pieces The danger is not past, however. Some of the remaining miles-wide pieces are big enough to do serious damage to our cities, climate, and global economy. Clube and Napier (1984) predicted that in the year 2000 and continuing for 400 years, Earth would enter another dangerous time in which the planet's changing orbit would bring us into a potential collision course with the densest parts of the clouds containing some very large debris. Twenty years after their prediction, we have just now moved into the danger zone. That may seem like bad news, but there is a glimmer of good news too. For the first time in human kind's known history, we have ways to detect those objects and prevent them from hitting us again. One such effort is Project Spaceguard, a multinational cooperative attempting to locate those Earth threatening objects, and other similar programs include the Near-Earth Asteroid Tracking (NEAT) telescope and the Spacewatch Project at the University of Arizona. Unfortunately, not one of them is funded nearly well enough to complete the job for many years, bur they are working at it steadily. No one knows exactly how many dangerous comets and asteroids are out there, but astronomers are certain that hundreds to thousands of them remain undiscovered. The worst part is that many of those space objects are so dark and difficult to see that they are nearly invisible until they come very close, and by then it is too late. It is certain that one of these monsters is on a collision course with Earth - we just do not know the details. Is it days from now or hundreds of years from now? Even if we were sure one was coming, there is just very little that we can do about it currently. Our politicians are seriously underestimating these severe threats, which are capable of ending our species, just as they snuffed out the mammoths a mere 13,000 years ago, only an eye blink in cosmic terms. There are few threats of that magnitude facing us today. The survival of the human race is not seriously threatened by the avian flu, Al Qaeda attacks, the end of the Age of Oil, monster hurricanes, giant earthquakes, or enormous tsunamis; if any of those occur, most of us will continue with our lives. Furthermore, nothing on that list is broadly accepted as having caused worldwide extinctions in the past. The same cannot be said about supernovae and massive [cometary] impacts. Those two cosmic events are implicated in many of the largest extinctions on our planet over the last millions of years. Fortunately, we survived them, but many of our fellow species did not. Humankind might not survive the next one. It seems reasonable to forgo several of our military fighter jets each year to decrease our chances of being" nuked" from space by a supernova or a comet.